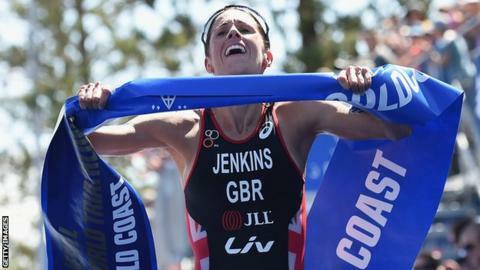 Welsh triathlete Helen Jenkins believes she has done enough to secure a place at this summer's Rio Olympics but had sympathy for rival Jodie Stimpson. The 32-year-old secured her first World Series win since 2012 with victory in the Gold Coast event in Australia. Her main rival for the final spot in Britain's female team, Commonwealth champion Stimpson, finished 12th and three minutes slower than Jenkins. "I really feel for her. My heart breaks for Jodie," Jenkins said. "Our team is so strong and it doesn't seem fair that she might not be going to the Games. "The team's not announced yet but I think I've probably done enough." Jenkins and England's Commonwealth champion Stimpson are competing to join Non Stanford and Vicky Holland as Britain's female triathlon contingent in Rio this summer. Britain's selectors will meet in the next week to decide nominations on who will join Wales' Stanford and Holland in Rio de Janeiro. "Helen demonstrated exactly what she is capable of, and she's done an outstanding job after years getting herself back from injury," British Triathlon performance director Brendan Purcell said. Two-time world champion Jenkins finished 41 seconds ahead of current world champion Jorgensen of the USA with New Zealander Andrea Hewitt finishing third. Current world champion Jorgensen had been unbeaten in World Series events since 2014. "I didn't have the best swim," Jenkins said. "Coming to the first buoy I was way back so I gave myself a bit of a taking to and managed to move up by the end of the first lap and I was next to Gwen. "On the bike Andrea was phenomenal and I was just hanging on her wheel. "I felt better as it went on but that bike really hurt."